Over the last 10 years since I become a driving instructor I have worked hard at maintaining high standards. In doing so I have always kept a high pass rate. According to the DSA “The average pass rate is around 43% with those passing first time being even lower”. I am pleased to say that my first time pass rate amongst pupils from Berkshire schools is 78% as of 16th January 2014 which represents almost 10 years to the day that I become a driving instructor. My overall first time pass rate which includes all pupils not only those at school is still a very high 72%. I achieve this with great attention to detail. I work hard with all pupils to ensure that when they go to test they are at the best possible standards. The reason for this is not simply to boost my own pass rate but more importantly to ensure that pupils are well prepared and safe for the real world once they have passed. I can recall many stories from pupils who I was teaching at the time of their friends who had passed who simply had no idea of what they were doing once they were driving by themselves and my pupils found themselves instructing them or pointing out hazards to them which they hadn’t seen. This doesn’t however mean that I make pupils take more lessons than they really need. It means that I work very hard with my pupils to provide the best possible tuition and at the same time making good use of every lesson so that they progress as quickly as they can manage or as quickly as they want to. It is important at this stage to point out that this is my own personal pass rate and is not the pass rate of the school as a whole. The reason for this is that I can not ensure other instructors who become franchisees of my driving school keep the same meticulous records that I do. 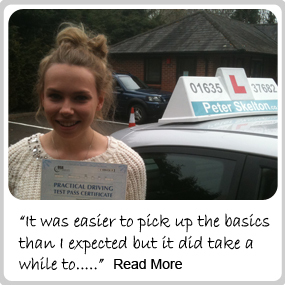 However anyone who becomes a franchised instructor of my driving school has to work to the same high standards as I do so you can rest assured that you will receive the same level of from any instructor of Peter Skelton driving school. I do this by monitoring their standards and holding regular meetings to make sure standards are kept high. I ask you to please provide honest feedback on your tuition and if you feel that you are not receiving tuition to the highest standards then this needs to be brought to my attention and an investigation will be made.